A group of community stakeholders traveled part way up Mount Elbert last Wednesday to evaluate the logistics of installing a head gate and flume on Corske Creek. The group, which included representatives from the Lake County Board of County Commissioners and Public Works, Parkville Water District, the United States Forest Service, United States Fish and Wildlife Service, Colorado Department of Public Health and Environment and the City of Aurora, examined potential sites for the flume, as well as environmental impacts. 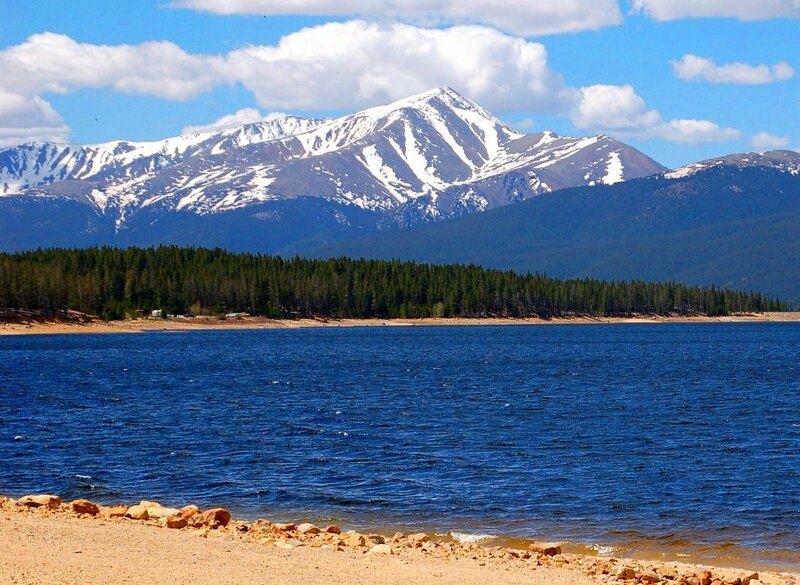 In January 2017, the Colorado Division Two Water Court approved Lake County’s augmentation plan after approximately six years in water court. The court decision granted Lake County administrative use of 34-acre-feet of consumptive use water, stemming from the water right associated with Derry Ditch No. 3. Additionally, the augmentation plan changed the water’s use from solely agricultural to also allow for commercial and residential uses. In order to start storing and leasing the 34-acre-feet of water, Lake County must measure and report the amount of water physically flowing through the area. To do so, the county must construct a head gate and flume on the creek. Last Wednesday’s outing clarified that installation of a flume will have to wait until at least next summer. Obtaining a permit for the installation of the flume would take between six to 18 months, representatives from the USFS said. Depending on the location of the infrastructure, wetland and beaver habitat disruption are also potential concerns. The task of charting a path around shortage hasn’t been easy. The state’s main water agencies — the Central Arizona Water Conservation District (CAWCD), which runs the Central Arizona Project, and the statewide Arizona Department of Water Resources — have been unable to reach an accord regarding who should speak for Arizona before committing to a proposed Lower Basin Drought Contingency Plan (DCP). Their standoff — and particularly the Central Arizona district’s management of Colorado River water — has resulted in bruised relations between Arizona and Upper Colorado River Basin states — Colorado, Utah, New Mexico and Wyoming. Still, there is an increased sense of urgency to get something done, with a record-low snowpack contributing to the driest 19-year period on record. 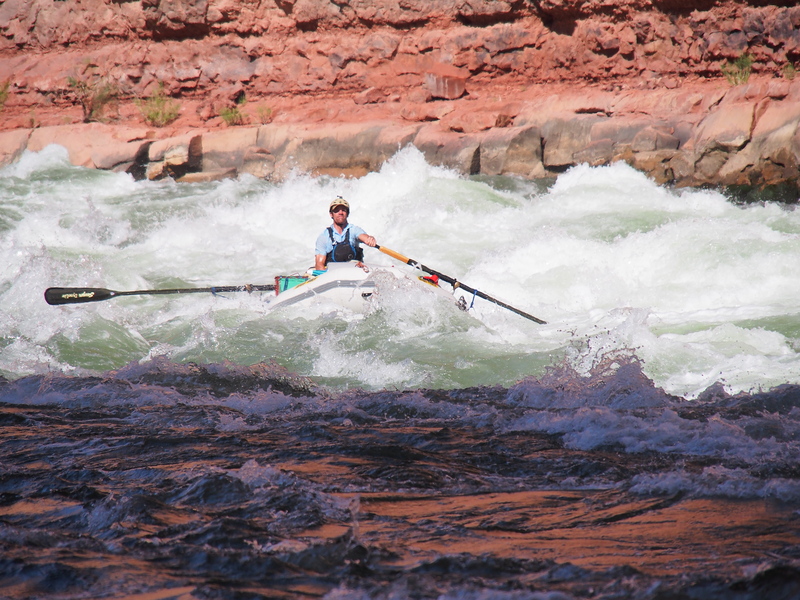 A meager runoff this year from the Rocky Mountains into Lake Powell — the Upper Basin’s key reservoir — is expected to be 42 percent of the long-term average. The Weaver Ditch as it winds through Sopris Park in Carbondale. While the ditch is an amenity for the community, the water in the ditch comes directly out of the Crystal River, which is often stressed from lack of water. A project funded by Pitkin County aims to keep more water in the Crystal River by improving the efficiency of Carbondale’s Weaver Ditch. 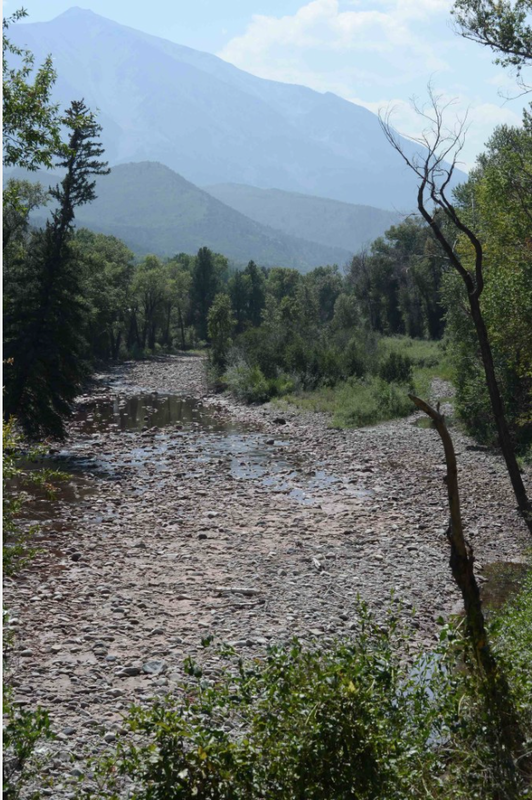 The Weaver Ditch Existing Conditions Assessment will survey the roughly three miles of ditch that flow through downtown Carbondale from its diversion point at the headgate just west of state Highway 133 near South Crystal Bridge Drive to its confluence with the Roaring Fork River. From the survey will come a detailed engineering plan to pinpoint where improvements could increase efficiency, delivery and use of the irrigation water. Four gauges will be installed in the ditch to help measure and understand the flow pattern. The Weaver Ditch (also known as the Weaver and Leonhardy Ditch) is mostly used for raw water irrigation of Carbondale’s open space, parks, golf courses, schoolyards and residents’ yards. 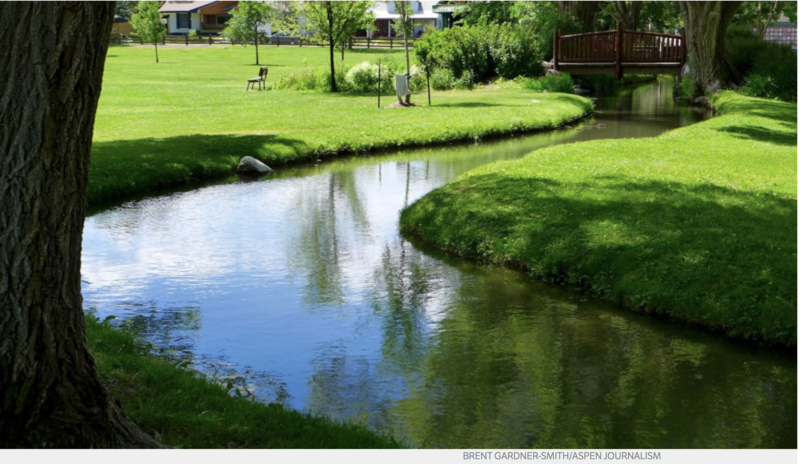 The Weaver Ditch runs through Carbondale and Sopris Park, and residents can use it to water their lawns and gardens for free. Built over a century ago, the open (unpiped) and unlined Weaver Ditch could potentially be leaking water into the surrounding soil in some areas. “Most of these ditches are pretty old, and the folks get in there and they clean them out and they do everything they can with them with the resources they have, but they were built and designed and created basically with the technology from the 19th century,” Ken Neubecker told the audience at a May 31 State of the River meeting in Carbondale. Neubecker is associate director of the Colorado Basin Program for American Rivers and a Pitkin County Healthy Rivers and Streams board member. The Weaver Ditch diversion structure, known as a ‘push-up dam,’ will be upgraded as part of the Weaver Ditch Efficiency Project. A conditions assessment this fall will survey the three miles of ditch that run through Carbondale. Carbondale has three water rights that allow it to divert water from the Crystal River into the Weaver Ditch, a total decreed use of 12.36 cubic feet per second. The oldest of these rights dates back to 1885. According to Carbondale Utilities Director Mark O’Meara, the town diverts on average about 3.5 cfs from the Weaver Ditch during the irrigation season and has not diverted its full decreed amount in quite some time. Part of the reason, O’Meara said, is because there often isn’t enough water in the Crystal River, especially during the late summer irrigation season, for the town to divert its full decreed amount. The survey is a collaboration between the town of Carbondale, the Roaring Fork Conservancy and American Rivers. 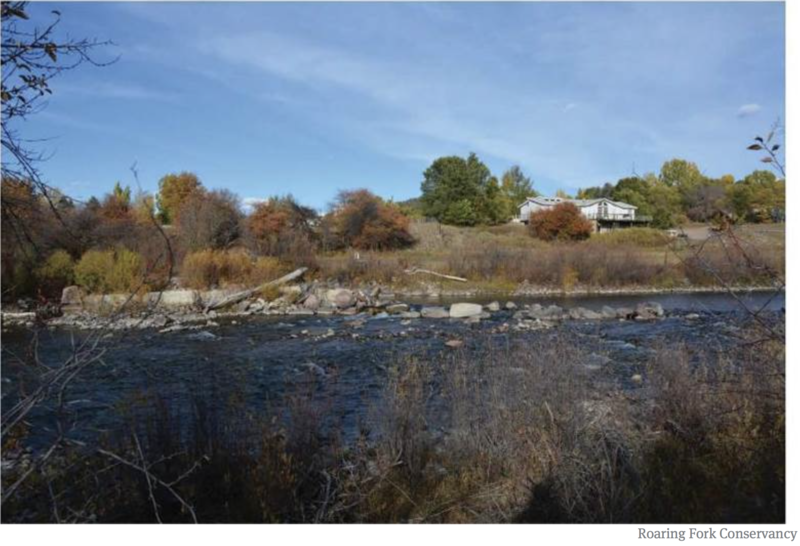 Pitkin County commissioners approved $30,000 in funding for the project from the county’s Healthy Rivers and Streams Fund at a May 8 work session. The survey has a total cost of $40,000 and work is slated to begin this fall once the ditch has been turned off for the season. The remaining $10,000 in funding will come from private donors, according to Heather Tattersall Lewin, watershed action director at the Roaring Fork Conservancy. In the hot, parched summer of 2012, the Crystal River south of Carbondale was reduced to a trickle. Photo/Ken Neubecker via The Mountain Town News. Besides leaving more water in the river, another goal of the project is to serve as an example for other upstream irrigators on the Crystal, especially those who might be reluctant to participate in a ditch survey. Not having enough water in the lower Crystal River has been a concern in recent years. The 2012 drought left a section of the Crystal between Thompson Creek and the state fish hatchery dry during the late summer irrigation season. Leaving more water in the lower Crystal River — an additional 10 to 25 cfs during times of moderate drought — is a goal of the 2016 Crystal River Management Plan. To accomplish this, the plan calls on the town of Carbondale to line its leaky irrigation ditches. It also suggests creating non-diversion agreements, or paying irrigators to reduce their diversions, and helping them improve ditches and install sprinkler systems. According to the Crystal River Management Plan, converting an earthen ditch to a concrete ditch or pipeline conserves as much as 30 percent of diverted water because it reduces water loss to seepage and evaporation. 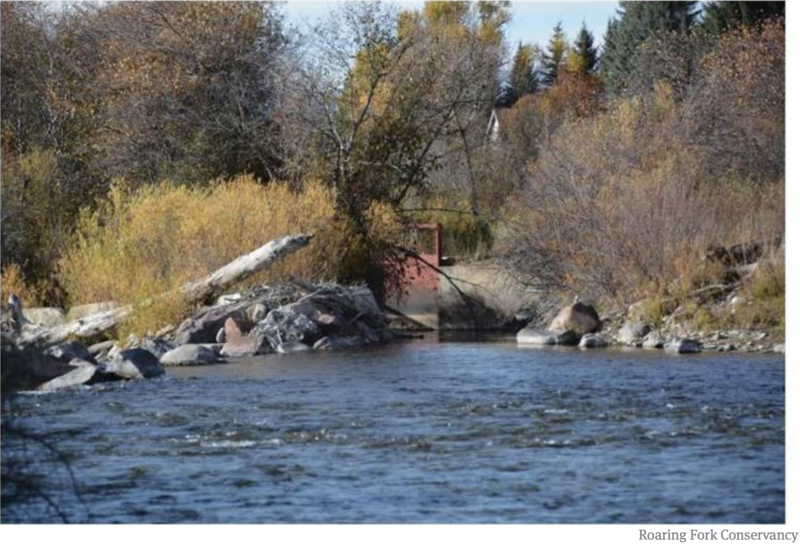 The Colorado Water Conservation Board holds a junior instream flow right of 100 cfs in summer and 60 cfs in winter, which is currently the only permanent mechanism in place to ensure there is water for ecological purposes. But during times of drought, the instream flow right is often not met due to the board’s junior status to most other diverters under Colorado water law. The Weaver Ditch is downstream from where the worst dewatering takes place. But Lewin Tattersall hopes the Carbondale project will inspire upstream diverters to survey their own ditches. “We know there are places upstream where efficiencies could be beneficial and having the town of Carbondale demonstrate that they bought into the process and be an example is great because anywhere on that lower Crystal River could use more water,” Tattersall Lewin said. The Weaver Ditch also will see its headgate and diversion structure improved as part of the Crystal River Restoration and Weaver Ditch Efficiency Project. In March, the board approved $20,700 in funding for the project. Currently, town staff adjusts the headgate manually, depending on demand, rainstorms and other factors. But the goal, O’Meara said, is for the system that opens and closes the headgate to eventually become telemetry-based and automated. Ultimately, the Weaver Ditch survey is a first step toward addressing the potential of a future with less water. As climate change raises temperatures, that could mean longer growing seasons for crops and a greater demand for more water. Editor’s note: Aspen Journalism is collaborating with The Aspen Times, the Glenwood Springs Post Independent, the Vail Daily and the Summit Daily News on the coverage of rivers and water. The Times published this story on Saturday, June 16, 2018.